From designer duds to vintage treasures, fierce fashion has always been your passion. 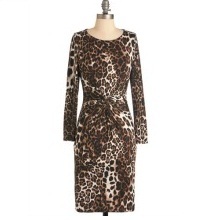 It’s no surprise, then, that you feel right at home in this Leopard-print shift – its long sleeves, ruched waist, and silky, body-hugging fabric are as flattering as they are fabulous. Worn with citrus-hued heels, angular earrings, and a statement ring, this dress is simply ‘purr’-fect! – 96% Viscose, 4% Elastane. – Machine wash cold inside-out; colors may bleed. Do not bleach. Do not tumble dry. Lay flat to dry recommended. Cool iron. Do not dry clean.